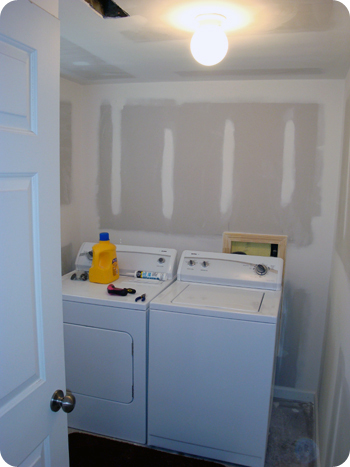 Home Lifestyle	It’s a….Laundry Room! I’m SORRY! But that was too easy. I WILL be updating the baby-news as soon as we get done with our appointment. 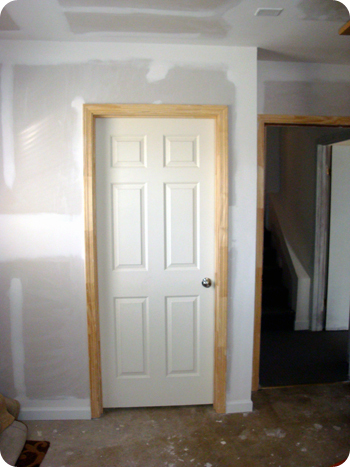 But for now, I wanted to share some news about our OTHER baby, the renovation! We are so close to being finished, I can taste the primer. In fact, all that’s left is cleanup, painting and installing the floor! Yay! When all is said and done, I will post a proper before and after, but for those of you who can’t wait here are a few progress pics! 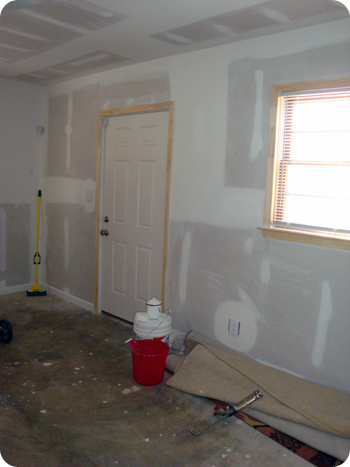 This is the main room – what will be the music/craft room. A little something for everyone! I still can’t decide on the wall color. I want it to be something fun and brighter than the rest of the basement which is a lovely shade of “String of Pearls” to brighten it up. From the other direction in the main room there is a door. It is the door to Narnia…otherwise known as MY VERY OWN LAUNDRY ROOM. The thing is, I have never had my own laundry room in my entire adult life. I am so beyond excited about this that it might just be my new favorite room! Right now I am thinking a nice lemon yellow to accompany that clean feeling. Definitely needs to be bright and cheery and fun, because why not? It’s a laundry room! I am also crazy excited about all the organization shelves and bins that come with the project. The bins!! I really, truly love doing laundry, so my laundry room has always been important to me. I don’t know how I would live without one. You’re going to love it! I remember feeling that joyous when I got a car with cupholders! And good luck with baby news. How exciting! I so wish I had a laundry room. I have a laundry closet. It’s my own fault, as that’s the floor plan I chose, thinking it would allow more living space. What it does is take away from living b/c all you can hear is the washer/dryer when trying to watch tv, have a conversation or eat dinner. I cannot wait to see your finished pics! Seriously though, how exciting is your life these days? I don’t know what I would do without a laundry room. Yours is looking great. YAY! I can’t wait to see what you have done!